By capturing and degrading organic waste in a controlled environment, waste providers and municipalities can ensure a cleaner environment while contributing to a much larger effort to reduce and reuse. United Kingdom households generate 7 million tons of food waste per year, a majority of which (4.2 million tons) is considered avoidable, meaning it was edible prior to being thrown away. Curtailing food waste has been on the government’s radar for decades; in 1999, the European Union announced the European Landfill Directive, which, aims to reduce reliance on disposing of organics in landfills. The target for member states is to divert 65 percent of organics by 2020. In the UK, the directive has promoted many waste reduction initiatives that span the food supply chain. From manufacturing to consumption, entities are voluntarily taking steps to drive change in how products are designed, produced, sold, consumed, and re-used or recycled. This evolution is also driving change in the waste management industry. According to the Waste and Resources Action Programme (WRAP), avoidable food waste in the UK was responsible for generating 20 million tons of carbon dioxide (CO2) equivalent in 2016, representing 3 percent of the UK’s domestic greenhouse gas emissions and equivalent to the amount of emissions produced by 7 million cars per year. Capturing and processing food waste holds valuable opportunity, to recover renewable energy and mitigating the detrimental environmental impacts of disposing food waste in the same manner as non-organics. Alternative treatments to process food waste and mixed solid waste (MSW) are plentiful and include technologies such as gasification, pyrolysis, plasma and biological drying. Anaerobic digestion, however, is a preferred method that is currently used to treat 1.78 million tons of UK food waste per year. This treated waste produces just under 60 MWe of renewable electricity, which is predominantly sent to the national grid. 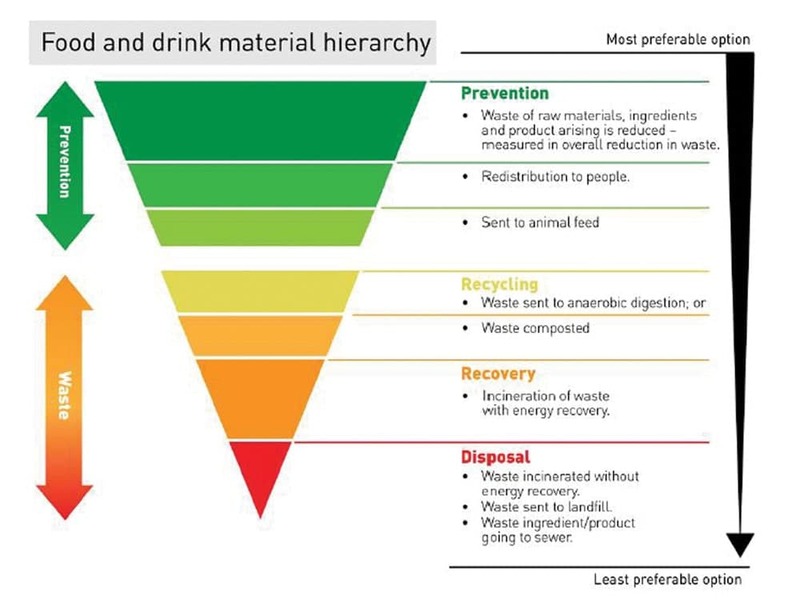 One of the biggest benefits of anaerobic digestion is that it is considered a recycling method rather than energy recovery, ranking higher on the UK’s waste management hierarchy (see Figure 1). The Bridgewater Advanced Digestion Facility in Walpole, UK is one example of a plant that uses anaerobic digestion to process food waste. Owned and operated by Viridor Waste Management, Bridgewater ADT treats around 20,000 tons of residentially source segregated food waste (SSFW) from the Somerset Waste Partnership, which jointly manages waste collection from all 239,000 homes in Somerset, UK. Overall the plant design capacity is up to 30,000 tons per year to handle any future increase in collection. The plant employs SUEZ’s advanced anaerobic digestion process, which includes pretreatment to separate organic content from the contaminants in the SSFW stream. SUEZ’s Re:Sep* pre-treatment technology was used and converts incoming solid SSFW into a digestible slurry, which is fed to downstream anaerobic digestion. Figure 2 shows the simplified process flow and mass balance of the Bridgewater facility. The first step in the process is the mentioned pre-treatment, whereby raw SSFW received at the facility is sent through SUEZ’s RE:Sep process. The SSFW is fed into a shredder where it is broken down into smaller pieces. Depending on the nature of the SSFW, the dry solids content can be 20 to 30 percent. Once shredded, the SSFW is conveyed to turbo dissolvers where liquid is added to bring the dry solids content down to promote blending of the organic material into a homogeneous slurry. The SSFW slurry leaves the turbo dissolvers and flows by gravity to the first step of contaminant removal. The slurry is passed across a rotary drum screen, removing all contaminants and packaging larger than the screen opening. Heavy contaminants such as metal and stone settle in the turbo dissolvers, which are periodically removed. For maximum recovery, the reject fraction from the screen is conveyed to a second step organics capture. At this step, a hammermill uses direct force on materials to press and pulverize material fed to it, resulting in the separation of any attached organics to the contaminants, as well as producing a slurry from large, hard organics. The organic slurry passes through the screen inherent in the hammermills and is combined with the slurry flow from the rotating drum screen previously mentioned. Reject material from the hammermill is the only contaminant stream coming from the RE:Sep system, and is typically quite dry at over 50 percent dry solids content. The combined slurry then travels through a grit channel where the velocity is slowed and at roughly 10 percent solids content, the grit settles out. To improve grit removal, however, in an effort to prolong the life of downstream equipment, a hydrocyclone was added to the pre-treatment process to assist with grit removal. The clean slurry is pumped to a hydrolysis buffer tank where it is held for four to five days to provide equalization volume and to ensure continuous feed to the downstream digester. Hydrolysis and acidification occur creating a low pH environment, pre-conditioning the slurry for maximum digestion. Prior to digestion, the slurry goes through a final pre-treatment step, of pasteurization through the Monsal* 70 pasteurization process. In pasteurization, the slurry is held at 70°C for one hour to comply with the UK Animal By-Products Directive. The pre-treated slurry is then sent to the site’s 4,000 m3 mesophilic anaerobic digester, which is a continuously stirred tank reactor, maintained by the Monsal Sequential Gas Mixing System. With a retention time of 18 to 22 days, the digester converts the organic food waste slurry into 12,000 m3/day (300 scfm) of biogas. The biogas is collected and used in two GE Jenbacher+ combined heat and power (CHP) engines that produce renewable electricity and heat. The design plant capacity is 1.5 MWe per 30,000 tons of food waste. Residual digestate is dewatered through an onsite centrifuge, creating a digestate cake that is approximately 25 to 30 percent dry solids by weight. The inherent nutrient content of the feedstock is carried throughout the entire process and is concentrated in the cake, which can be used as a nutrient fertilizer on agricultural land. Furthermore, as all of the material have undergone pasteurization, use is not restricted. As mentioned earlier, liquid is added to the turbo dissolvers in the RE:Sep process. Considering the high strength of the centrate, it is treated in a sequential batch reactor (SBR) to degrade ammonia and COD. The Bridgewater Advanced Digestion Facility is a product of Somerset County’s partnership with Viridor Waste Management to recycle household food waste into methane gas to generate clean, green power for homes and businesses, and fertilizer for the local agricultural community. While this article focuses on anaerobic digestion for SSFW from residential collection, the described plant design is applicable to a wide variety of food waste sources. 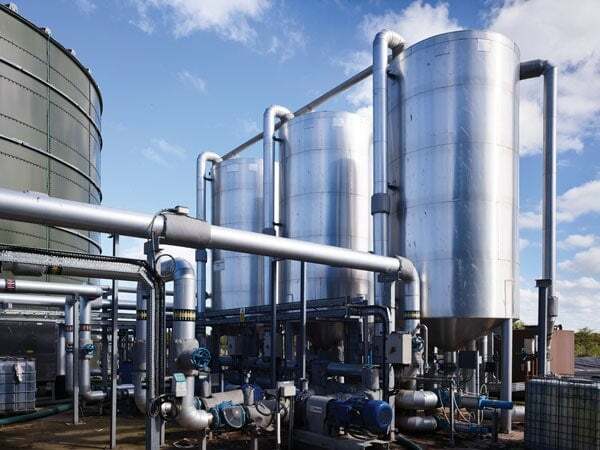 Anaerobic digestion in the UK has been very successful, however some of that success must be attributed to the forethought of government and legislators to incentivize its use. Similar trends can be seen throughout Europe thanks to the influence of the European Union’s Landfill Directive. Larger challenges for adoption exist in countries where legislation and incentives are not widespread. North America would seem to be a prime market for anaerobic digestion of food waste; however, the economic model for a sustainable plant is not yet robust. Still, the global trend towards adoption of anaerobic digestion of food waste is upward. Anaerobic digestion offers a sustainable waste solution. By capturing and degrading organic waste in a controlled environment, waste providers and municipalities can ensure a cleaner environment while contributing to a much larger effort to reduce and reuse. Michael Theodoulou is a senior product manager for SUEZ – Water Technologies & Solutions with more than 18 years of experience in the water/wastewater and waste treatment industries. Based in Ontario, Canada, Michael can be reached at michael.theodoulou@suez.com.